In your home's wiring system, the grounding system is a critical safety feature. In the event of some kind of breakdown in the system, the grounding system provides a path of least resistance that ensures current will flow safety back to the earth itself. It thus reduces the chances that a short circuit can cause a fire or life-threatening shock. The final and most important part of a home's grounding system consists of a metal ground rod driven deep into the earth, wiring that connects this rod to a service panel or utility meter base grounding lug, and the connector clamp between the wiring and the rod. This "earth ground" is a very important part of your electrical system to ensure electrical safety. According to the National Electrical Code, or NEC, a ground system should have a grounding resistance of 25 ohms or less. Achieving this may require more than one ground rod. Ground rods, also known as grounding electrodes, are used to connect the grounding system of electrical systems to earth ground. Ground rods can be made with many different materials, but copper is the most common materials used for residential installations. Ground rods are very good conductors of electricity and allow any dangerous electricity to flow to ground, taking the danger away from you and the electrical panel. 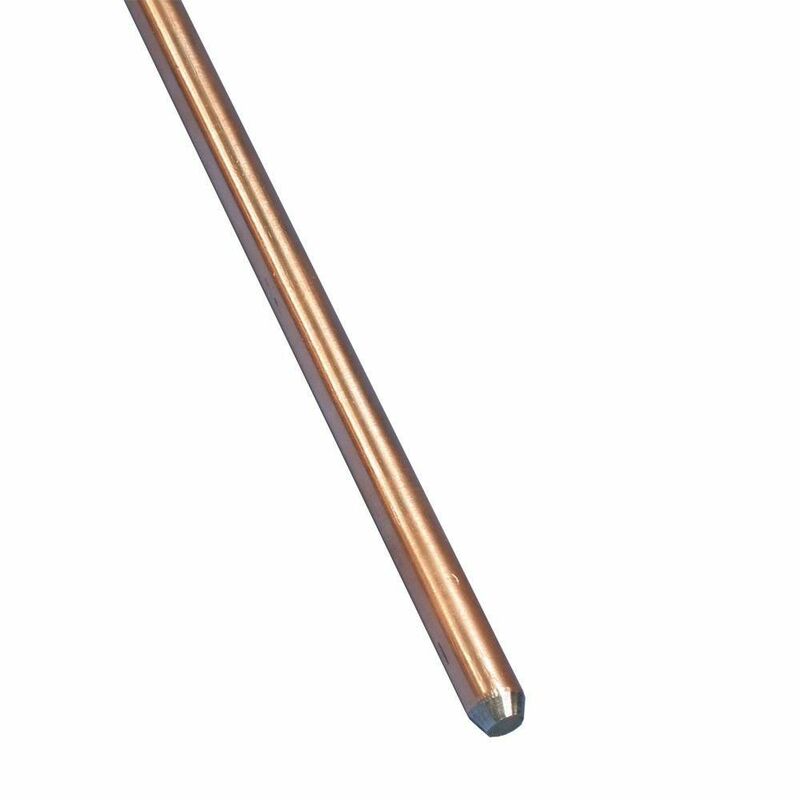 The grounding rod that connects the home grounding system into the earth is a long metal rod, usually copper bonded to steel, galvanized iron, or stainless steel. Ground rods come in both 8-foot and 10-foot lengths, with 8-foot being the most common size used in residential installations. As a rule, ground rods must be a minimum of 8 feet long and should not be cut down. In very dry ground, which provides more resistance than moist soil (meaning it does not accept electricity as readily), ground rods are sometimes stacked and joined with a special clamp so they can extend deeper into the earth. Another option is to add a second ground rod. This is usually a better option, but the rods must be at least 6 feet apart, according to the NEC. Whenever possible, ground rods should go into moist soil around your home. Usually, the area close to the foundation has enough moisture due to runoff water from downspouts. It is unwise and unsafe to install the shorter, 4-foot ground rods often sold for grounding things like TV antennas and other individual devices. These are not legal for grounding the home electrical service, and they can cause your grounding system to fail when it is needed most. Ground rods come in varying thicknesses (diameters), including 3/8", 1/2", 3/4", and 1". The minimum allowed diameter for a ground rod is 3/8", but larger sizes are a better choice because they provide more surface area to contact the earth. The ground wire, often referred to as the grounding electrode conductor, is the link between the ground rod and the service ground connection. Ground wires for residences typically are made of copper and are #6 (6 AWG) or larger. An acorn clamp is an oval-shaped clamp with a bolt used to tighten it to the ground rod. An acorn clamp is the most commonly used clamp for ground rod connections and is approved for direct burial applications.The grounding conductor should be attached to the ground rod and in the "V" of the acorn clamp, opposite the bolt side of the clamp. The brass-toothed clamp is a two-piece clamp that has two setscrews used to secure it to the ground rod. It also has a center point with a hole to mount the wire and a set screw to tighten the wire. This type clamp is best used inside to make grounding connections around water pipes that are grounded to the ground bus of a service panel.